While CBC News cameras are rolling, police launch into hot pursuit as a minivan speeds through a CounterAttack stop in Burnaby, B.C. 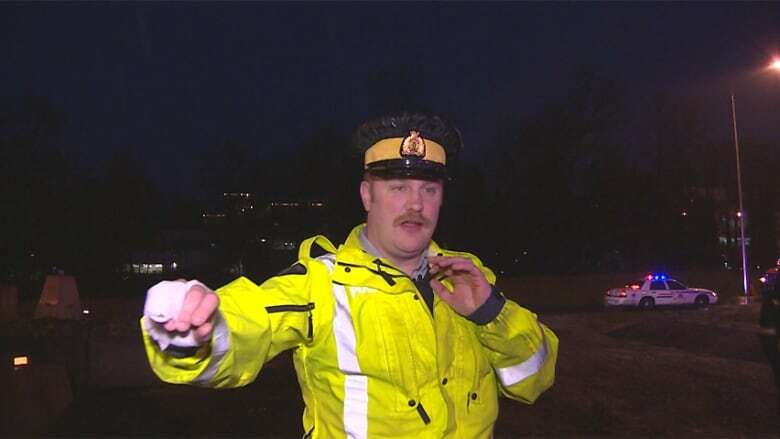 CBC News was filming as the driver of a minivan suddenly sped through a CounterAttack road check at the Grandview Highway on ramp to Highway 1 eastbound, early Saturday morning. 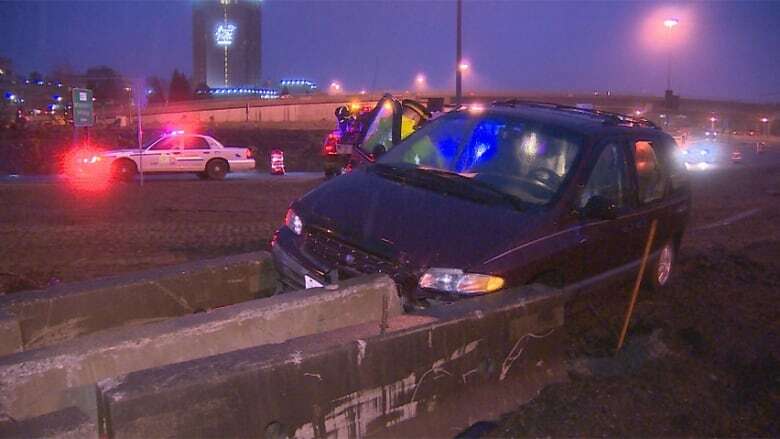 The minivan accelerated past Burnaby RCMP Cpl. Robert McDonald while he was being interviewed about roadside suspensions and drinking and driving statistics. "Just as we were asking somebody, he pulled over slowly and as soon as the car in front of him cleared, he simply took off," McDonald said. As the driver sped through the remainder of the road check, a number of officers scrambled to get out of the way, including Const. Chris Redhead, who was later taken to hospital with a hand injury. "As it went by my partner, I heard him yell, 'Stop,' and I just started to get out of the way like that," Redhead said, raising his arms in a defensive posture. "Pushed out and hit the window with my hand and broke it." The van didn't make it far. It was found abandoned just over a kilometre away, at the Highway 1 exit at Willingdon Avenue. It had collided with construction dividers on the side of the road. Police began to surround the area, and called for a dog squad to help track the suspects down. "They knew that we were coming. They simply dropped the vehicle just down the ramp here, and took off running," MacDonald said. A dog tracked three men, who were apprehended and taken into custody. Police say the men are all in their 30s, and will be facing a number of charges. Officers believe the van, which was found with a number of tools inside, is likely stolen. It also had a broken window, which police believe happened when the van struck Redhead's hand. The minivan was towed to the Burnaby RCMP garage for forensic testing.